There is more to subject knowledge than being able to do the maths yourself. The Primary SKE Work Group develops primary teachers’ mathematical subject knowledge so they can understand, teach and support pupils effectively. A key focus is not only improving the participant’s ability to ‘do’ mathematics but also to ensure they have the appropriate pedagogical knowledge to teach their pupils well. Who is this for? All primary teachers. It is most suitable for those with 2+ years’ experience. Collectively, the network of Maths Hubs across England work on projects around national maths education priority areas. One of those priorities requires Maths Hubs to provide high quality training in teacher subject knowledge in mathematics, and to ensure that pedagogy is closely linked with subject knowledge. 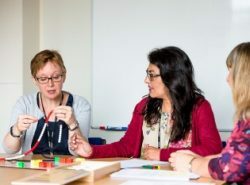 Each Maths Hub participating in a national project runs a local Work Group, where teachers come together over a period of time to work on areas defined by the project. All Work Groups are subject to a common evaluation process, which collectively provides a body of evidence on the project’s outcomes. So, your participation in this Work Group will contribute to your own professional leaning, and that of your school colleagues, as well as making a contribution to the improvement of maths education at a national level. This Work Group extends work started in the 2017-2018 national project of the same name. Funding This work group is funded by the Maths Hub grant and can be offered at no charge to delegates.